Lewisham Council is a White Ribbon borough. Details of events that are being planned for 2014 to encourage men to address violence are detailed on their website. “Violence against women happens more than you think. It’s mostly committed by men. We won’t stand for it. 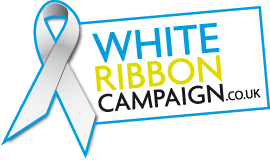 The first White Ribbon Campaign was launched by a group of men in Canada after the brutal mass shooting on 6 December 1989 of 14 female students at the University of Montreal. They felt that it was indicative of a broader issue of violence against women and that men should take responsibility for challenging social acceptance and underlying causes as well as reacting to this specific atrocity.